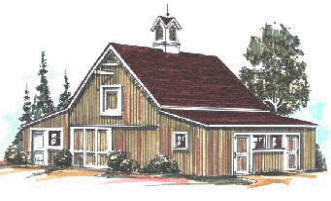 Combine your horse barn with a work or hobby shop in the Crabapple Barn & Workshop. It has a 12'x24' shop and tractor garage next to a barn that you can build with either two or four stalls. A 20'x24' Loft adds convenient storage space. 2-Stall Barn Floor Area: 1,008 Sq. Ft., 4-Stall Floor Area: 1,208 Sq. Ft., Loft Area: 480 Sq. Ft.